Do not be left wondering if you could have paid less! 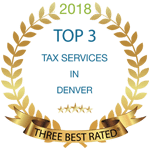 If you own a Denver-based business — regardless of whether you offer a service or a product or how big or small your business is — you must file and pay your taxes with the taxing authorities. It not, you may face business IRS problems with the local, state or federal tax agencies. Keeping current and compliant on your taxes takes a great deal of time and effort, and we often see well-intentioned business owners fall behind because they’re overwhelmed by how much they owe or the prospect of dealing with the IRS. As a business owner, you’re required to file and pay your federal and state income taxes, as well as payroll taxes and sales taxes if you sell products. Becoming delinquent on any of these taxes may result in collection efforts or penalties levied against your business. If your tax bill goes unpaid and you don’t make arrangements to pay your debt before the due date, the first step in the forcible collection of your debt is a tax lien on your Denver-area business, which is how the IRS protects the debt. A lien is a legal claim against your business assets, filed via a public document known as a Notice of Federal Tax Lien. The lien alerts creditors and finance companies that the IRS has a legal right to your property to the extent of tax you owe and remains in effect until the taxes are paid in full or other arrangements are made. A lien is public record, which means your customers or even potential customers can see you’re having tax issues. Once a federal or state tax lien is filed, you may also face the possibility of a tax levy to legally seize your company’s properties and assets, including your bank accounts, accounts receivable and business property and equipment. Think of the impact the seizure can have on your business cash flow—which you’ve set aside for payroll, office rent, supply purchases, and payroll taxes—and on relationships with your customers. If your company faces a levy or lien, it’s important to deal with your tax problems as quickly as possible to minimize the impact on your business. The IRS was contacting my contractors I work for and telling them to not pay and send the money to the IRS instead. This left me with no money to pay my employees and I was unable to get the IRS lady that was doing this on the phone or to return my call. I spoke with True Resolve Tax and asked what my options were after they came highly recommended. Within two days of hiring them they had been able to speak to the lady at the IRS, get her to agree to stop the levies with my contractors and even got enough of the money she had recently taken back to allow me to cover payroll for my employees. This was HUGE! If my employees couldn’t get paid I would have been out of business. I was very impressed with how quickly True Resolve went to work and got results. I had fallen behind on my payroll tax payments and had the IRS coming to my place of business to talk to me. I was worried they were going to shut me down. I was referred to True Resolve Tax by a friend of mine. The True Resolve team instantly came in and started talking to the IRS person so I didn’t have to. They helped me to budget for my business better so that I could pay the current taxes and set up a payment plan on the taxes I hadn’t paid yet. The payment is very affordable and the budget help has kept me on track since then also. Great service, great people, great customer service. In the twelve plus years that I’ve been having my taxes professionally prepared, this years’ preparation by True Resolve was the most professionally, well organized and presented I’ve ever experienced! Due to events out of my control the person doing my taxes was unable to complete them so, with only a few days until they were due I called True Resolve, they were very courteous and took me on as if I was the only client they had. I am so glad to have found them and will be using them for all my future tax needs. 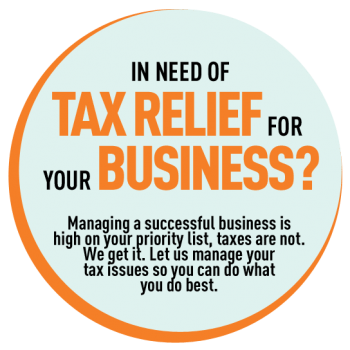 Looking for help business tax management? Book Your Private Tax Discovery Session Today. Federal, state and local authorities can also assess penalties for failing to pay to your taxes. The penalties increase your tax bill, making it even more difficult to catch up on back taxes and stay on top of current tax obligations. Taxing agencies have more than 100 possible penalties they can assess on you and your Denver-based business, some assessing up to 75 percent of the tax amount you owe, a variety of enforcement techniques to collect them. Federal and state officials are particularly aggressive in pursuing the collection of payroll tax debt you owe. They view this as a form of theft, and payroll tax debt is one of their first collection priorities when it comes to business taxes. The best way to avoid tax penalties is to file your taxes on time and set up a payment plan if you can’t pay them right away. You will almost always end up paying more when you don’t file on time. Plus, if you only focus on what you already owe, you will never stay current. And if you only focus on your current taxes, then you’ll never address what’s past due. True Resolve offers you the right expertise, experience and integrity you need to deal with delinquent taxes. Don’t wait one minute longer to get in front of your business tax problems. We guarantee the information and tools you need to keep your business finances running smoothly.